The Automatic Subscription rules (aka Subscriber Rules) has been given a complete overall. Whilst we generally point people to our new Import Wizard, the Subscriber Rules feature allows things to happen in near real-time. Simply set up the rule in Salesforce and watch the Leads and Contacts fly over to Campaign Monitor when they match a rule. ‍The live preview saves having to manually edit test records to see if they will meet a rule. You can also search for specific emails to see if they match (handy for seeing if an important contact will be added or not). Subscriber rules can run each time a record is created, updated or deleted. This can result in a lot of background processing. If you simply need to bulk import Salesforce data into Campaign Monitor, then we suggest using the Import Wizard. It's also worth noting that the Automatic Subscriptions tab is no longer visible by default. The rules can now be found on the Subscriber List page. Whilst it’s great having email statistics stored directly within Salesforce, we now also provide a Lightning Component that can visualise the data stored in Campaign Monitor. 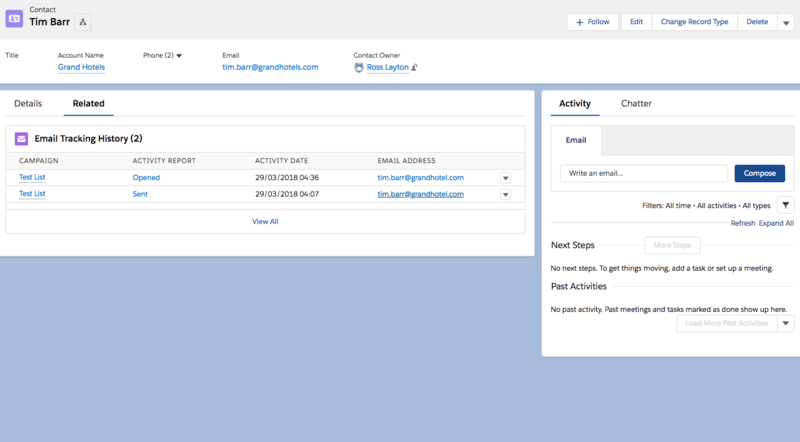 The Email Activity component can be installed using the Salesforce Layout Editor in Lightning. Look for the new component named Email Activity. NB. a) Currently, the Email Activity is only available in Salesforce Lightning and, b) we don't automatically install it as part of the page layout wizard. c) the component can be put onto either a Contact or Lead object.